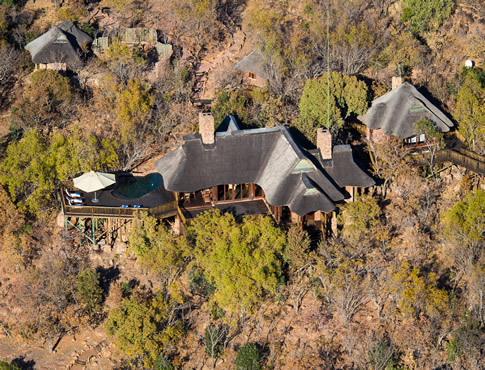 In an area traditionally known as the wild lands of the Waterberg, Welgevonden is an exclusive nature reserve where the finest is freely available and privacy is a right. Over 40,000 hectares of private game reserve, adjoining the Marakele National Park, have become a landmark conservation area - and with game soon to be moving freely between Marakele and Welgevonden. Following one of the largest game relocation programmes ever undertaken on private land, Welgevonden once again became home to the "big five" - lion, elephant, buffalo, leopard and rhino. This malaria-free reserve has many species of antelope, zebra, giraffe, baboon, hyena, wild dog, and other fauna foraging on planes and verdant slopes, while perennial waters hide crocodile and offers sustenance to a huge variety of birds. The pristine beauty of the Waterberg region offers a variety of habitats: riverine scrub, woodland, grassland, fertile valleys and great tracts of water, both above and below ground - a natural paradise for game and an unfolding ecosystem which will reflect the legendary herds of Africa".